According to analysts, the annexation formalities for the new entities could be completed by the end of 2014. On Tuesday, March 18, President Vladimir Putin signed an intergovernmental agreement giving Crimea and the city of Sevastopol the status of full-fledged members of the Russian Federation. According to analysts, the annexation could be completed by the end of the year. Before signing the agreement, Putin addressed both chambers of parliament. He noted that Russia and Crimea have a common history and the Crimeans are tired of "forced assimilation" from the authorities in Kiev. Putin stressed that Ukraine still has no legitimate authority, and many state agencies are under the control of radical nationalists. “There is still no legitimate executive power in Ukraine. There is no one to talk with,” said Putin. Regarding allegations of alleged aggression or annexation, the president said that Russia did not send troops into Crimea, but only strengthened its existing forces without exceeding the limit set by international agreements. At the same time, Putin made it clear that Russia intends to take into account the rights of all peoples living in Crimea and respect their ethnic identity. “It would be proper if Crimea has three equal languages ​​- Russian, Ukrainian and Crimean Tatar”, he stressed. 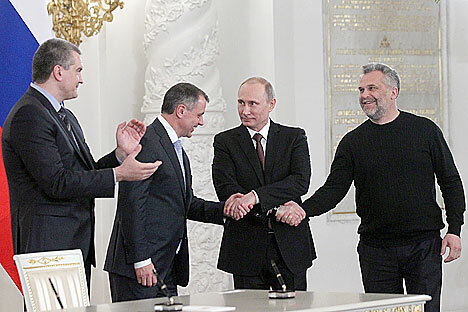 The intergovernmental agreement between Russia and the Republic of Crimea that would allow Crimea and the city of Sevastopol to enter the Russian Federation was signed by Vladimir Putin, Chairman of the State Council of the Republic of Crimea Vladimir Konstantinov, Chairman of the Council of Ministers of Crimea Sergei Aksenov, and representative of Sevastopol government Alexei Chaly. The agreement states that the Republic of Crimea is considered to be a part of Russia at the moment of the signing. New entities have appeared in the Russian Federation -- the Republic of Crimea and the federal city of Sevastopol. However, to complete the legal annexation of Crimea and Sevastopol into the Russian Federation, the agreement must be ratified by the Russian parliament, and be verified by the Constitutional Court of the Russian Federation to see whether it complies with the constitution. Deputies present at the event have already announced that the document would be given a fast track towards ratification. This morning the deputies are scheduled to meet with a delegation from Crimea. On the evening of March 18, the Speaker of the Federation Council Valentina Matviyenko and members of the upper chamber met with the Crimean delegation. It is possible that the law will be passed already on March 21. Under the agreement, there will be a transition period until January 1, 2015 during which issues of integrating the new entities into the economic, financial, credit and legal system of the Russian Federation will be resolved. The day Crimea is integrated into the Russia, laws of the Russia Federation will be in effect on Crimean territory. Laws of the Republic of Crimea and the city of Sevastopol will be in effect until the end of the transition period or until the necessary laws are adopted by the Russian Federation. Professor of the Constitutional and Municipal Law Department of Moscow State University and member of the Civic Chamber Elena Lukyanova said, it is not clear when the text of the agreement will be discussed. “After Crimea appealed to the Russian parliament, they had to attend consultations with the deputies regarding the annexation agreement. Whether they could introduce and ratify the agreement so quickly is not yet clear,” she said. “So far everything is being done in strict accordance with general constitutional law on the procedure for annexing a new entity into the Russian Federation. The existing procedure has been fully complied with.” She further elaborated that since the procedure is being used for the first time in relation to another state, its nuances are still unknown. “In general, I can imagine why the country's leadership made such quick decisions. It can be explained by the fact that the Küçük Kaynarca peace treaty of 1774 was taken into consideration. According to the treaty, if Crimea leaves the Russian state, then Turkey could claim it,” said the lawyer. She also noted that if Russian domestic legislation is fully complied with, there are still many unresolved issues in international law.